Originally published on NRDC expert blog. The U.S. Department of Energy (DOE) may be sitting on approximately $600 million in Fiscal Year 2018 (FY18) funding for clean energy research and development (R&D), despite clear and strong congressional guidance to invest public dollars in new technologies and innovation that will pave the way for America to be a leader in a clean energy future. ARPA-E has not spent more than $280 million (79 percent) of its $353 million FY18 research budget; and, EERE has not spent more than $319 million (14 percent) of its $2.32 billion FY18 research budget. We urge Congress and the U.S. Government Accountability Office (GAO) to investigate why so much congressionally approved R&D funding does not appear to have been put to use. We are sending a letter today to the relevant appropriators in Congress. The delays are concerning because they undermine America’s ability to develop clean energy innovations that can lower the cost of electricity, create jobs, and reduce the pollution that is jeopardizing our health and our planet. The government is the single-largest source and propellant of energy research funding, and previous DOE-sponsored R&D investments have led to such breakthroughs as highly efficient lighting technology, dramatic cost reductions for solar and wind technologies, and battery improvements that enabled the expansion of the electric vehicle industry. U.S. businesses and entrepreneurs are eager to put their ingenuity to work to lead the global transformation to a clean energy future—but they are being held back by DOE’s failure to support them in fully seizing that opportunity. For context, China’s government invests nearly three times more in energy R&D than the U.S. government as a percentage of the gross domestic product. Furthermore, China’s total federal R&D budget is projected to grow at a rate much faster than ours. With energy accounting for 20 percent of the Chinese R&D budget (compared to just 2 percent in the U.S.), our future global competitiveness is being put at risk. However, none of this should be too surprising given the Trump administration’s head-in-the-sand approach toward climate change and its unabashed desire to revert to a world in which polluters can reap massive profits at the expense of the health of our communities. Consider, for example, the Trump administration’s disastrous proposal to eliminate ARPA-E and to slash EERE funding by nearly 70 percent. Thankfully, both Republicans and Democrats in Congress recognized that clean energy R&D is a top-notch investment for the federal government and categorically rejected the administration’s proposal by increasing funding to ARPA-E and EERE to historic levels. But now, the Trump administration may be intentionally ignoring the will of Congress by allowing hundreds of millions of dollars to collect dust instead of fulfilling its responsibilities to jump-start the development of next-generation technologies. Earlier this month, Bloomberg Environment detailed an episode where a delay in EERE awarding solar research funds resulted in both wasted time and money. Unlike most parts of the government that must spend funding within a certain timeframe (generally one year), DOE’s research funding is so-called “no-year money” (without a time limit). That allows DOE to support R&D opportunities that might not be aligned with the government’s fiscal calendar. However, such critical flexibility also comes with the expectation and responsibility to effectively use public dollars to spur innovation and advance national goals. Disburses funding to the awardees on a specified schedule. However, this process has recently been plagued by uncharacteristic delays at every step for some prominent offices within DOE. More than two months after the conclusion of FY18, our analysis shows ARPA-E has not spent more than $280 million of its $353 million FY18 research budget. Of the amount that was spent, approximately 40 percent went toward staff salaries and travel—and only $44 million was awarded for R&D. Furthermore, no plans have even been announced for $162 million of the unspent funds (i.e., there is no indication of active plans to set them aside for specific FOAs). While there are three outstanding FOAs that will utilize $118 million in FY18 funding, ARPA-E only announced them in the past few months despite Congress having approved the appropriations bill back in March. ARPA-E should have been able to get those FOAs out the door much faster (and even been able to announce awardees by this point). As a point of reference, the following graph shows the percentage of the annual budget that had been accounted for through FOAs announced as of each month of FY15 to FY18. 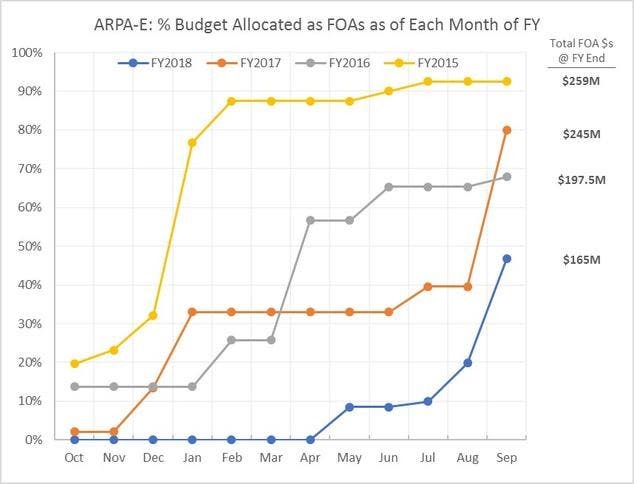 As is clear from that graph, ARPA-E was slower at issuing FOAs in FY18 relative to previous years—even relative to FY17 when the budget was finalized later in the fiscal year (May of FY17 vs. March of FY18). That type of holdup is a large cause of the delay in getting critical research funding into the hands of U.S. innovators. It is unclear whether the FY18 delay is attributable to deliberate foot-dragging or an innocent holdup. However, last year the GAO slapped ARPA-E on the wrist for illegally and intentionally withholding FY17 funding. Moreover, the Trump administration proposed eliminating ARPA-E in its FY18 and FY19 budgets. This targeting of ARPA-E has been pursued despite the clear value that it has delivered to-date: Since its launch in 2009, ARPA-E has provided more than $1.8 billion in grants and funding to over 660 projects nationwide (as of February 2018)—which in turn created over 71 new U.S. companies and attracted more than $2.6 billion in new private-sector funding. EERE has dragged its feet on issuing FOAs. In June, EERE’s Advanced Manufacturing Office issued a Notice of Intent to publish an FOA for a new Energy-Water Hub. The notice said that it “expects to issue the FOA in July 2018.” More than four months later, there is no sign of that happening despite Congress having appropriated $20 million for it. EERE has canceled part of an FOA. In August, hundreds of researchers who submitted applications in response to an FOA from EERE’s Solar Energy Technologies Office were informed that a $46 million portion had been canceled. This happened two months after the application window closed and right before awardees were supposed to be announced. The stated rationale was “to better align the FOA objectives to the mission objectives of DOE.” Though EERE subsequently set aside the $46 million for a separate FOA that was largely similar to the canceled portion of the original one, this maneuvering had unclear benefits while resulting in needless extra work for applicants and DOE staff—plus at least six months of delay in getting the research funding out the door. Democracy Forward submitted a Freedom of Information Act request in an attempt to determine whether the stated rationale is accurate and subsequently filed a lawsuit due to the lack of responsiveness from DOE to that request. For more details on the this FOA, see the aforementioned piece from Bloomberg Environment. EERE has dragged its feet on selecting FOA awardees. Only $3 million of EERE’s Water Power Technologies Office FY18 funding has been awarded in the form of an FOA, despite over $25 million having been scheduled to be awarded by September 2018. The same is true for the Building Technologies Office (BTO), where $46 million in funding has not been awarded for FOAs that were issued in April 2018 and May 2018. As one example, the following graph shows the percentage of the annual BTO budget accounted for through FOAs announced as of each month of FY15 to FY18. BTO was slower at issuing FOAs in FY18 relative to previous years. NRDC urges Congress and the GAO to investigate whether DOE is intentionally ignoring the will of Congress regarding the distribution of clean energy R&D funding. Every dollar of DOE research funding has historically generated huge economic returns for Americans in the form of jobs, lower household energy bills, and other benefits—20 to 1 according to a National Academies study. Given that, hundreds of millions of dollars of unspent research funding represents tens of billions of dollars in lost U.S. economic benefits that our economy and environment cannot afford to miss out on today or in the future. Click here for our analysis methodology. Related Stories: Renewable Energy Is Bringing Good Jobs To The Midwest. Is Anyone In Washington Paying Attention?